IDC analysts interviewed eight organizations that rely on Forcepoint NGFW solutions to support their network operations. 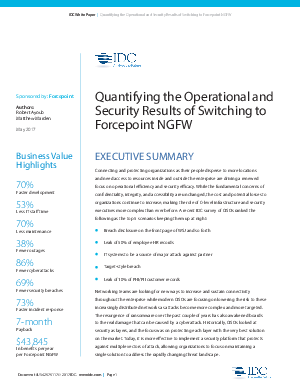 Based on this analysis, they then built a model to identify the costs and real benefits of deploying Forcepoint NGFW. On average, these organizations experienced a return of cost in just seven months, with an average 510% ROI in five years. Read the report to learn how these organizations realized improved efficiency, availability and security with Forcepoint NGFW.